Photos: Photos in this post by Danielle (http://lucierphotography.com/) / Edited: By me! Maiyan and Choora day is here! 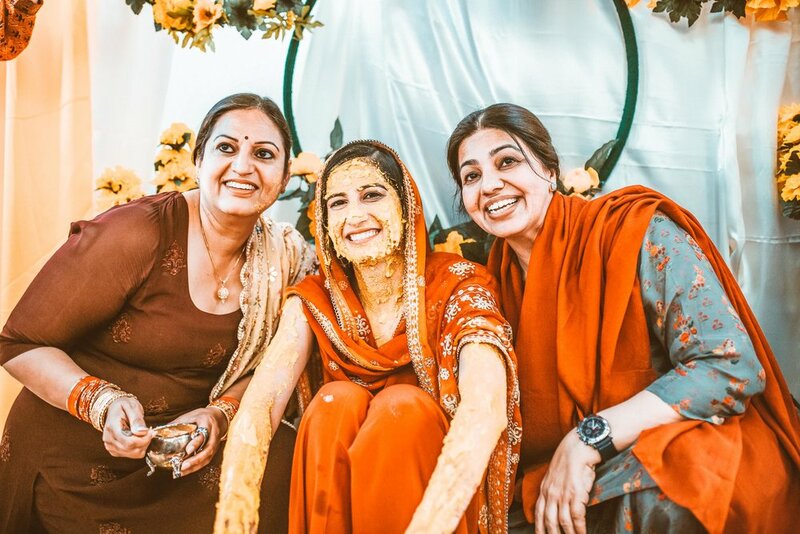 We started with Maiyan, where all your close family and friends put turmeric paste on you to get you ready for the wedding. Its supposed to ward off any evil and make you glow for the big day! Next is the choora! This is when your mamaji (maternal uncles) will put wedding bangles (choora) on the bride by dipping them in a milk and water mixture first. This is followed by adding the kalirey - gold decorations that hang from a bangle or kara. During this ceremony, the maternal aunts will also gather around and assist the uncles in putting the bangles on. Traditionally the bride would wear 21 red and ivory coloured bangles on each arm. Odd numbers are considered auspicious in Indian culture. These days the number of bangles worn and their design are now dictated by the bride’s choice.. or in my case my maternal homies aka I was told to ‘stick to tradition’ and I was happy to! There is something about keeping things classic eh? A phulkari or traditional chunni to hold over the top of the bride. I was lucky and my mom’s wedding chunni and great grandmother’s phulkari provided all the protection and blessings I could ever need!